We recognize that the Faculty, the Staff, the Administration, and the Board of Trustees of DePauw University are committed to the health and the future of the university. We recognize that the institution faces serious financial challenges that require a viable long-term financial plan. We recognize that the Faculty and the Administration need to review and strengthen the academic program to ensure students’ access to the best possible curriculum. 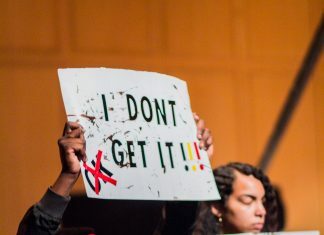 We recognize that members of our community—staff, faculty, and students—are marginalized and disadvantaged by institutional structures and attitudes that make for a less inclusive university. We recognize that under President McCoy’s leadership the university has seemingly moved from crisis-to-crisis and that decisions made in response to these crises often exacerbate rather than solve them. We recognize that the urgency of these, and other concerns, lead many of our colleagues to support a vote of no confidence in President McCoy and a request that the Board of Trustees dismiss the President. And yet, we believe it is far more urgent to start doing the work of collaborative planning that a series of “no confidence” votes will inevitably delay. We have, therefore, decided to abstain on this Vote of No Confidence in President McCoy. We cast this vote not because we disagree with the many concerns expressed in the rationale for the motion—indeed, we believe these are legitimate concerns—but because we believe a Vote of No Confidence is likely to weaken the University at a time when it already is in a precarious state and at a time when it needs the full and immediate attention of the Faculty, the Staff, the Administration, and the Board of Trustees. We invite our faculty colleagues who feel similarly to join us.